Our calculating software is the Neugart Calculation Program (NCP). It provides you with the basis for designing the planetary gearbox for a complete drivetrain. In just a few minutes, you can configure the whole combination of motor and gearbox based on the entered application data. Your application therefore becomes cost and energy efficient. In the background, a complex software routine calculates all parameters for your whole drive train. Yet the tool is always easy to use: The NCP user interface presents a clear intuitive structure. You can choose from various applications like racks and pinions, spindles, belts, conveyors, rotary tables, slider cranks and winders. The relevant application parameters need only be transferred to the predefined application masks. Our comprehensive database lists the details of over 17,000 motors from all of the customary manufacturers. It comes fully integrated in the software. All parameters are visualized in real time. You can then very easily compare similar drive components with each other. The NCP lets you generate all of the relevant information and data that you need for your drive. We’ll be pleased to provide you with the NCP free of charge. 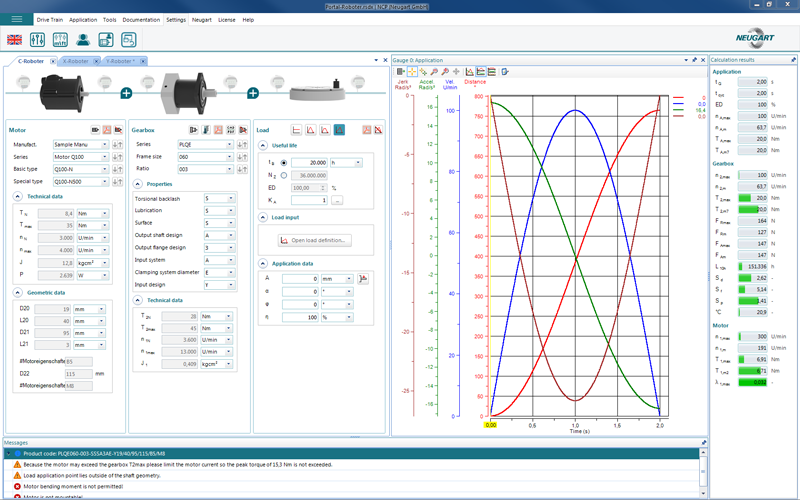 The Neugart Calculation Program (NCP) is our calculating software. You can select your language once you have downloaded the file.